From the 31 March 2014 edition of the New York Times by reporter Justin Gillis: important news from the International Panel on Climate Change about the serious impacts of global warming and rising GHG levels on the earth’s climate, natural communities, and human economic and social systems. YOKOHAMA, Japan — Climate change is already having sweeping effects on every continent and throughout the world’s oceans, scientists reported on Monday, and they warned that the problem was likely to grow substantially worse unless greenhouse emissions are brought under control. The report by the Intergovernmental Panel on Climate Change, a United Nations group that periodically summarizes climate science, concluded that ice caps are melting, sea ice in the Arctic is collapsing, water supplies are coming under stress, heat waves and heavy rains are intensifying, coral reefs are dying, and fish and many other creatures are migrating toward the poles or in some cases going extinct. The oceans are rising at a pace that threatens coastal communities and are becoming more acidic as they absorb some of the carbon dioxide given off by cars and power plants, which is killing some creatures or stunting their growth, the report found. Organic matter frozen in Arctic soils since before civilization began is now melting, allowing it to decay into greenhouse gases that will cause further warming, the scientists said. And the worst is yet to come, the scientists said in the second of three reports that are expected to carry considerable weight next year as nations try to agree on a new global climate treaty. Credit Christopher Jue/European Pressphoto Agency. 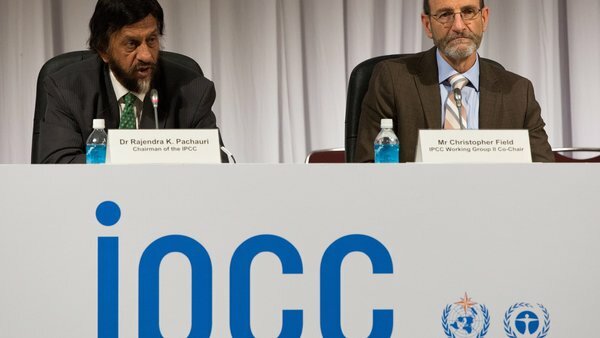 Rajendra K. Pachauri, the chairman of the Intergovernmental Panel on Climate Change, and Christopher Field, the co-chairman of the group that wrote the report, discuss its warning. In particular, the report emphasized that the world’s food supply is at considerable risk — a threat that could have serious consequences for the poorest nations. “Nobody on this planet is going to be untouched by the impacts of climate change,” Rajendra K. Pachauri, chairman of the intergovernmental panel, said at a news conference here on Monday presenting the report. The report was among the most sobering yet issued by the scientific panel. The group, along with Al Gore, was awarded the Nobel Peace Prize in 2007 for its efforts to clarify the risks of climate change. The report is the final work of several hundred authors; details from the drafts of this and of the last report in the series, which will be released in Berlin in April, leaked in the last few months. The report attempts to project how the effects will alter human society in coming decades. While the impact of global warming may actually be moderated by factors like economic or technological change, the report found, the disruptions are nonetheless likely to be profound. That will be especially so if emissions are allowed to continue at a runaway pace, the report said. It cited the risk of death or injury on a wide scale, probable damage to public health, displacement of people and potential mass migrations. “Throughout the 21st century, climate-change impacts are projected to slow down economic growth, make poverty reduction more difficult, further erode food security, and prolong existing and create new poverty traps, the latter particularly in urban areas and emerging hot spots of hunger,” the report declared. The scientists emphasized that climate change is not just a problem of the distant future, but is happening now. To think that thousands of independent researchers across the world are part of the biggest scientific conspiracy in history is ludicrous. Studies have found that parts of the Mediterranean region are drying out because of climate change, and some experts believe that droughts there have contributed to political destabilization in the Middle East and North Africa. In much of the American West, mountain snowpack is declining, threatening water supplies for the region, the scientists said in the report. And the snow that does fall is melting earlier in the year, which means there is less melt water to ease the parched summers. In Alaska, the collapse of sea ice is allowing huge waves to strike the coast, causing erosion so rapid that it is already forcing entire communities to relocate. “Now we are at the point where there is so much information, so much evidence, that we can no longer plead ignorance,” Michel Jarraud, secretary general of the World Meteorological Organization, said at the news conference. The report was quickly welcomed in Washington, where President Obama is trying to use his executive power under the Clean Air Act and other laws to impose significant new limits on the country’s greenhouse emissions. He faces determined opposition in Congress. Amid all the risks the experts cited, they did find a bright spot. Since the intergovernmental panel issued its last big report in 2007, it has found growing evidence that governments and businesses around the world are making extensive plans to adapt to climate disruptions, even as some conservatives in the United States and a small number of scientists continue to deny that a problem exists. “I think that dealing effectively with climate change is just going to be something that great nations do,” said Christopher B. Field, co-chairman of the working group that wrote the report and an earth scientist at the Carnegie Institution for Science in Stanford, Calif. Talk of adaptation to global warming was once avoided in some quarters, on the ground that it would distract from the need to cut emissions. But the past few years have seen a shift in thinking, including research from scientists and economists who argue that both strategies must be pursued at once. 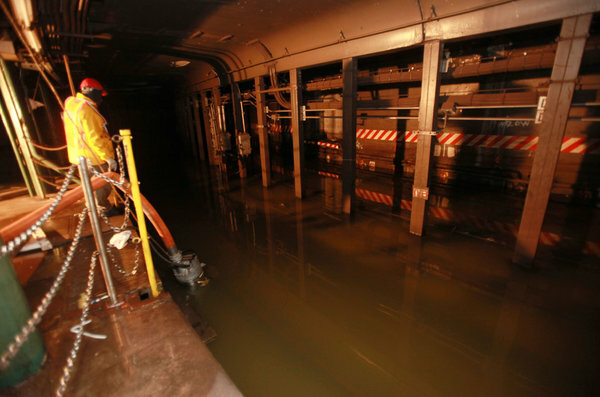 A striking example of the change occurred recently in the state of New York, where the Public Service Commission ordered Consolidated Edison, the electric utility serving New York City and some suburbs, to spend about $1 billion upgrading its system to prevent future damage from flooding and other weather disruptions. The plan is a reaction to the blackouts caused by Hurricane Sandy. Con Ed will raise flood walls, bury some vital equipment and conduct a study of whether emerging climate risks require even more changes. Other utilities in the state face similar requirements, and utility regulators across the United States are discussing whether to follow New York’s lead. But with a global failure to limit greenhouse gases, the risk is rising that climatic changes in coming decades could overwhelm such efforts to adapt, the panel found. It cited a particular risk that in a hotter climate, farmers will not be able to keep up with the fast-rising demand for food. The $100 billion figure, though included in the 2,500-page main report, was removed from a 48-page executive summary to be read by the world’s top political leaders. It was among the most significant changes made as the summary underwent final review during an editing session of several days in Yokohama. The edit came after several rich countries, including the United States, raised questions about the language, according to several people who were in the room at the time but did not wish to be identified because the negotiations were private. The language is contentious because poor countries are expected to renew their demand for aid this September in New York at a summit meeting of world leaders, who will attempt to make headway on a new treaty to limit greenhouse gases. Many rich countries argue that $100 billion a year is an unrealistic demand; it would essentially require them to double their budgets for foreign aid, at a time of economic distress at home. That argument has fed a rising sense of outrage among the leaders of poor countries, who feel their people are paying the price for decades of profligate Western consumption. Two decades of international efforts to limit emissions have yielded little result, and it is not clear whether the negotiations in New York this fall will be any different. While greenhouse gas emissions have begun to decline slightly in many wealthy countries, including the United States, those gains are being swamped by emissions from rising economic powers like China and India. For the world’s poorer countries, food is not the only issue, but it may be the most acute. Several times in recent years, climatic disruptions in major growing regions have helped to throw supply and demand out of balance, contributing to price increases that have reversed decades of gains against global hunger, at least temporarily. The warning about the food supply in the new report is much sharper in tone than any previously issued by the panel. That reflects a growing body of research about how sensitive many crops are to heat waves and water stress. The report said that climate change was already dragging down the output of wheat and corn at a global scale, compared with what it would otherwise be. David B. Lobell, a Stanford University scientist who has published much of the recent research and helped write the new report, said in an interview that as yet, too little work was being done to understand the risk, much less counter it with improved crop varieties and farming techniques. “It is a surprisingly small amount of effort for the stakes,” he said. This entry was posted in climate change, news, policy, pollution, science. Bookmark the permalink.